Flexibility is the key. Our sail date was changed several times due to mechanical issues. I’m ok with that. It beats getting out in the middle of the ocean and not having things work properly. We weren’t sure exactly when the Bigelow would sail as of Thursday, but were pretty sure it would be today at 10:00 am. NOAA had me fly out to get onboard. What a blessing that was. I was able to get acclimated (used to) to the ship, meet some crew members, and organize my belongings. 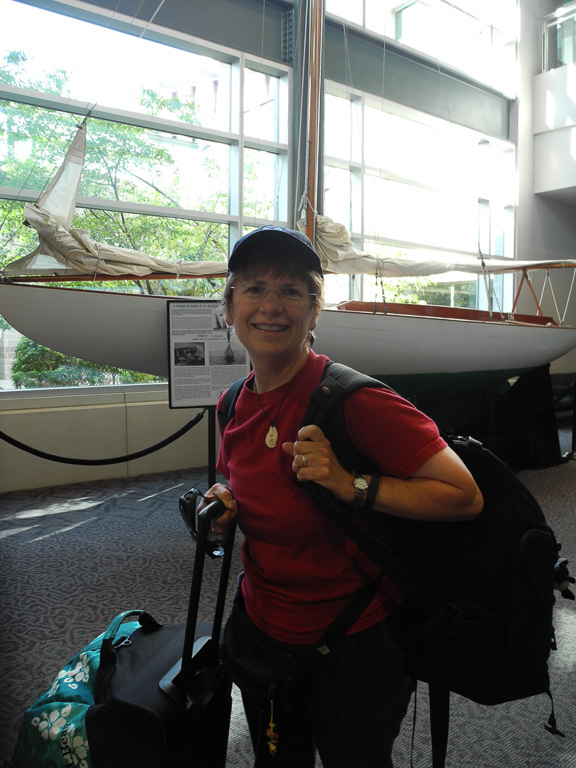 Mrs. Zupko beside the Henry B. Bigelow. That is a big deal since when docked, nothing is moving. Once we got underway, the ship rocks and rolls. Pencils loose in a drawer aren’t a good idea. Where to store the flashlight? Can I find my necklace in the morning? It’s about routine. The locker (my closet) is noisy to open and close and must be kept closed when underway. Try not to forget things since you have to open that door again–and you have to hold the door since it swings and will bang. Someone is always sleeping. Right now my roommate is sleeping so I am thankful I have a quiet keyboard. She has earplugs in and told me I wouldn’t bother her. I also got to pick my berth (bed), which is on the bottom. There will be four of us in the room when everyone arrives tonight–all scientists. So far I have had no “duties” other than blogging. When we start trawling, I will work noon-midnight. One of the scientists on my watch, Nicole, gave me a tour today and explained what I will be doing. My foul weather gear consists of heavy orange bib coveralls, a heavy yellow jacket with super long sleeves, and big rubber boots which come up to my knees. I brought inserts to go in the boots since I’ll be standing–a lot. Bought some new shoes that are slip-ons so I can get out of my foul weather gear as soon as we are done processing the fish. I learned that we probably will have over 100 trawls on this leg of the Autumn Trawl Survey and we will climb in and out of our gear often. Let me explain a bit about how things will happen. Over the ship’s intercom, which will be heard everywhere except our staterooms, the galley, and the lounge, there is a (Bing….Bong….) “Attention on the Bigelow. Streaming….” This means the nets are being let out and will be at the bottom about 20 minutes. What can I do for 20 minutes? Help me out and vote on my poll. 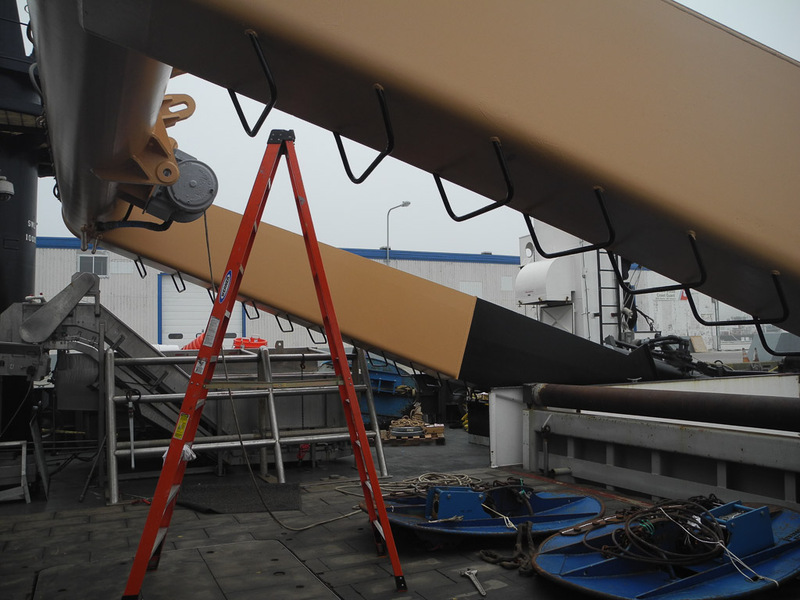 The blue trawl doors on the deck will be added to the net. As the net is let out, blue “trawl doors” attached to the net sink to the bottom, holding the net down and keeping the mouth of the net open. Now, the amount of time it takes to bring the net up varies. The net could have been 24 m down or 350 m down. When they start bringing in the net, the NOAA crew will make an announcement (Bing….Bong…. )”Haul back.” They will show me how to find the depth on the equipment so I will be able to judge when to be ready. When the net comes up, the fish will be dumped on a table called a checker. If there are too many, they get dumped on the deck (called a deck tow). I hope it fits in the checker since it will be less work. Imagine picking up all those fish from the deck and putting them in containers. The person in charge (called the “watch” chief) will weigh and label the fish and send the container on. Some fish will be selected for extra information. Others will be released into the sea. Animals that we keep will be for further research. The work we are doing is very important to monitor the ocean’s health. Health to the ocean, means health to us. If the ocean isn’t healthy, we had better find out why and correct it. It’s like a nurse takes your temperature and looks at your symptoms when you are sick. We are the nurses checking on the sea. Others will analyze the symptoms and come up with a plan to correct any problems. I will give more information on our work later. Ensign Erick Estela Gomez is originally from Puerto Rico. Most of my dealings when I boarded the ship were with him since he was the OOD, Officer of the Deck, for the weekend. In between his filling in reports and checking on the ship’s systems, we had a chance to talk. He is very personable and has a brilliant smile. Maybe his smile is infectious since he just got engaged to be married and is very happy. Added to his many abilities, he speaks four languages. He explained that he received an Environmental Science degree from the University of Puerto Rico. 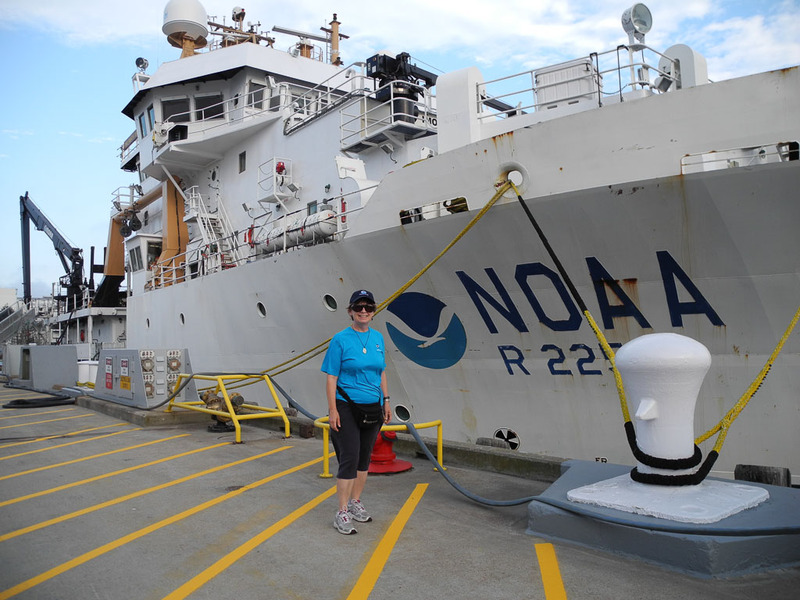 Most NOAA officers have a science or engineering degree or 60 credit hours in math and science. I need to check my records and see if I have that much. Maybe I could be a NOAA Corps officer. Ensign Estela’s favorite part of his job is steering the ship. I enjoyed doing that when aboard the Pisces. It is a challenge. While he was off doing a chore, I sat in one of the two tall chairs on the bridge (operations center of ship). When he was done, he explained, very politely, that it is ship’s custom that no one except the captain sit in those chairs. He has been an ensign 1.5 years and said he will not sit in one of those as a sign of respect until he has earned it himself by being appointed to be a captain of a ship. I guess I always figured it was like Captain Kirk leaving Scotty or Spock in charge and they would sit in his chair to give orders. But, Ensign Estela has a lot of respect for earning one’s rank and will sit there when appropriate. So, no cool chair for me on the bridge now. Ensign Estela paused to really consider what tool he couldn’t live without when doing his job since he uses a lot of important tools. He decided on radar. It can be very foggy and this tool helps avoid collisions (crashes). If he invented a tool, it would be a fog-clearing machine to be able to see smaller vessels (boats) or obstructions. There are collateral (other) duties for him. He is responsible for inventorying all the equipment on board. Every computer. Every pillow. He also needs to make sure things are in working order. If boots wear out, he needs to order more. That means managing a lot of paper so he needs organization skills. His main duty, however, is navigation officer. He checks the tides and currents and posts all that information on a white board on the bridge. 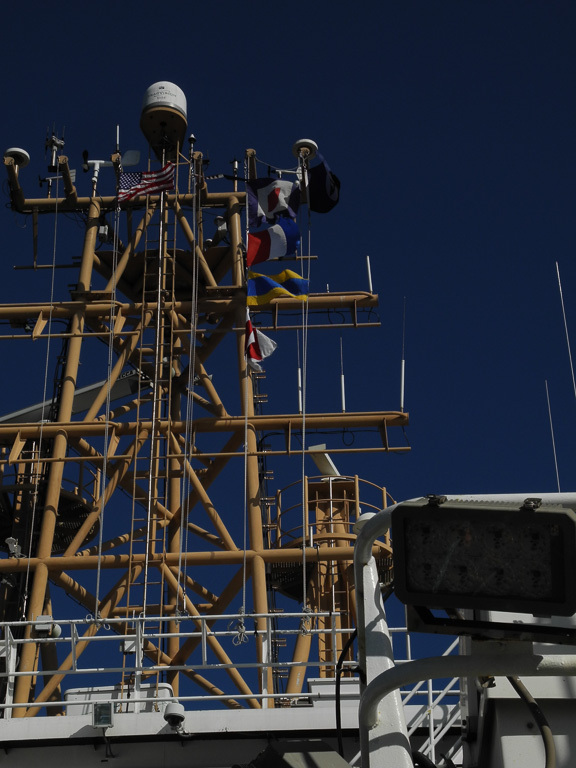 Maintaining charts, ship’s routes, and flags indicating our status are part of his job. I enjoyed learning a bit more from Ensign Estela on plotting the course using triangles. Triangles provide a nice straight edge. Navigation tools. Numbers on the map in water show depth in feet. Ensign Estela plots our ship’s course for day. His advice to my students, and any young person, is to keep up your math and science. Don’t sit in front of the TV or computer, get outside and do things. It’s obvious he does since he bicycles, fishes, and enjoys salsa dancing for relaxation. We call this Sharpening the Saw. This is the ships call sign. This week my students are studying how to communicate across distances on the ocean. How do ships communicate, for example? A ship might not have a radio. Flags work. There is a flag which states what country you are from. There are flags that say you have a net or a diver in the water. There are flags which tell your call sign if you want to speak by radio. There is even a flag for every letter of the alphabet. All these flags are up on the flying bridge, the highest deck on the ship. The ship usually uses true north for navigation. However, if that system fails, it uses magnetic north. North is 0°. That is like 90° on a coordinate grid. That is a bit confusing. We use degrees on maps all the time. Just remember that 0°N is used for navigation and wind direction. A tradition on board a ship is to remove one’s hat in the mess hall (dining area) and to not wear foul weather gear there. The mess hall was used during war as the hospital. People died on those tables and it is a sign of respect to remove one’s hat. Hats are often used to show respect. People remove their hats at a ball game to sing the national anthem. Men tip their hats to acknowledge a woman’s presence. People remove their hats in eating establishments. It is good to learn a country’s or culture’s (such as a ship) customs so as not to offend someone. That is also a sign of respect. When visiting churches while a tourist in Russia, I covered my head and wore a skirt, as is their custom. On board ship, once I leave my room for my watch, I shouldn’t return until my watch is over. That means carrying my computer, cameras, notes, jacket, phone, cup, water bottle, etc. with me so I don’t disturb those asleep. It’s just like being quiet in the halls at school. Guess what? They don’t want us talking in these halls either since someone is always sleeping. It is rude to disturb others, whether it be their sleep or learning. This entry was posted in 2014, NOAA Fisheries Service, NOAA Teacher at Sea, Sue Zupko 2014 and tagged Bigelow, navigation, net, NOAA Corps, plotting, trawl. Bookmark the permalink. Have you seen anything interesting lately? How is the food on the boat? Hi Mrs. Zupko! Your students are enjoying reading your blogs and getting updates that you have sent me. Do you have coordinates for us to plot your course on our maps? We hope you are well and not experiencing any sea sickness. We look forward to your next blog! You are making me drool over the possibilities! Have a grand time! I saw the captain in one of the chairs the other day. He was just observing. Pretty much the scientists explain what they need and the officer on duty gives the orders to do what the scientists need. Currently we are on the edge of the shelf looking for a place to trawl. The officers on the bridge are looking for a level spot between 200 m and 300 m that we could trawl for 20 minutes. There can’t be obstructions in the way to damage the net. So, we are using the multi-beam sonar to find a nice spot within our strata. The officers run over the area to make sure it is suitable. They then call down to everyone–the deckhands, engineers, and scientists, that we will be where we need to be to drop the CTD in 10 minutes. Everyone gets ready for that. Once the CTD is back, we will begin streaming (putting the net out). When they pull it in they say “haul back” so we scientists know that it is time to be ready to process the fish, which is why we are there. The watch chief from the night watch said they caught some flying fish, which is unusual. I think it is neat that you take off your hat in honor of the people who died there. Food is always provided. There is popcorn, leftover dessert from meals, hot chocolate, peanut butter and Nutella, bread, ice cream, crackers…. Hi Mrs.Zupko , thank you for the post card I will miss you to. I will write a letter to the Friday SPACE class every week. I can’t wait to tell you about Hawaii. Keep me up dated in your every day adventures! Mrs. Zupko I miss you very much still when you get the cups back why don’t you write about it. I wish i was there and thank you for the post card. and remember we are weatherly heights and we GO THE EXTRA MILE !!!!!!!!! (click) RAINBOWS!!!!!!! I miss you can’t wait to hear your next post! Trawling is dragging a net behind the ship on the bottom of the ocean. We have trawled anywhere from 24 meters to 500 meters. The fish are different at different depths. Internet is very spotty. It has been a little difficult to have communication by computer. I have worked with the scientists to have new Buzzwords for next week and a few weeks beyond. I have the coordinates, just haven’t had a moment to type them. I was feeling a “little off” our first full day at sea. Everyone was so kind. My roommate, Lacey, went to the mess and asked if they had crackers for me. Apparently they scrambled fast and even sent up a Ginger Ale to settle my stomach. I ate a bunch of crackers. Guess what! I wasn’t the only one. There was a run on Saltines when they were put out. Denise, our steward, had to put out more for everyone. Once the waves calmed down a bit, things were good. Our stateroom is the length of two single beds and the width of about 1.5 single beds. That includes our bathroom. The sink is out in the bedroom. There are 4 lockers and a desk in the room. I would describe it as cozy. Will type up coordinates as I dry my hair at the desk We got off work an hour ago. Been busy learning about the diversity of life in the ocean.